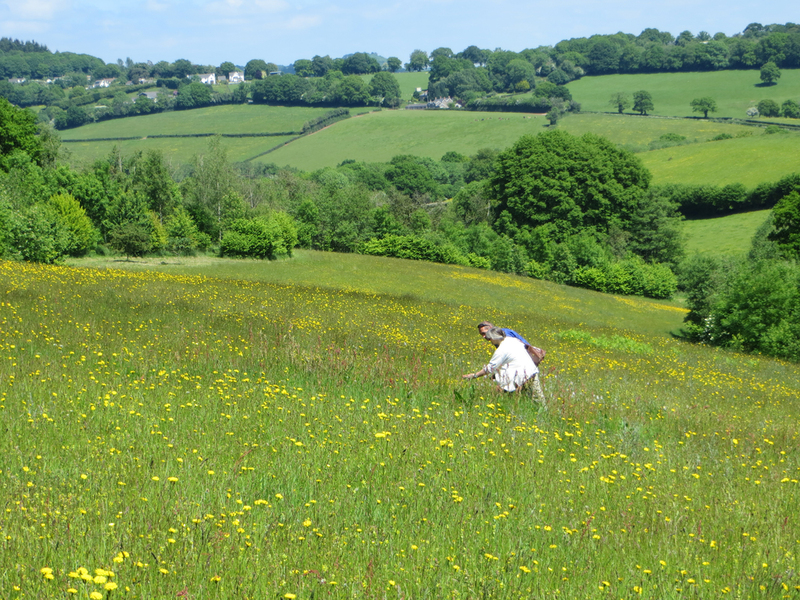 "Our final day based at the Stamford Gate Hotel in Holywell had the promise of being fine, and it duly turned out to be just about right for botanising - not too hot, too cold or too windy and above all, not wet. "The remaining groups were orchestrated with their destinations, and then my group set off for Moel y Crio on the south side of Halkyn Mountain. "The area had just over 100 post-2000 records, with a refind rate of 52%, so we were certain to make some additions, along with some possible refinds of rarer species". 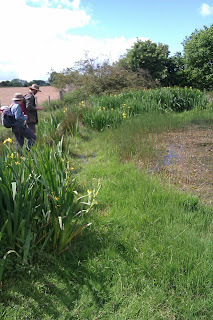 "We were highly successful, recording more than 260 species, possibly because of a reasonable mix of wild habitat - lanes, ponds, marshes, common land and a wood, with a mix of basic and acidic rocks, as well as mineral workings. 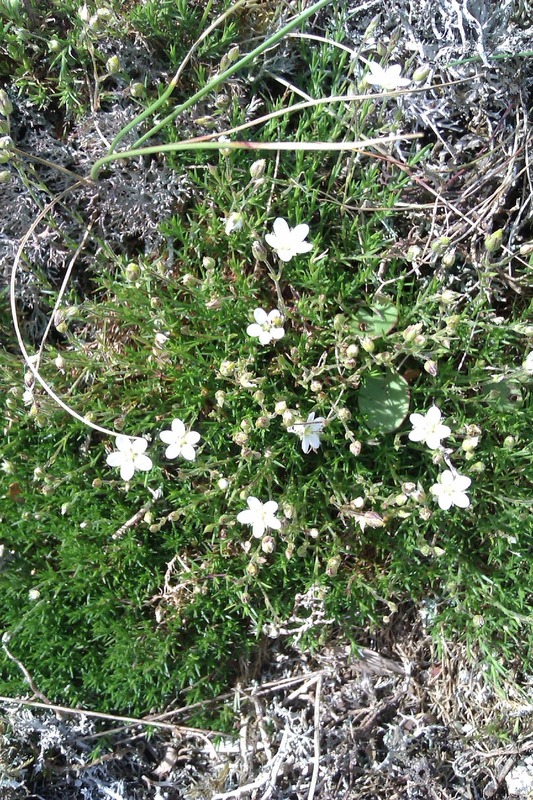 "Our first scarce plant was Pond Water-Crowfoot Ranunculus peltatus, growing in profusion in a pond. At the side of a track we found Monk's-hood Aconitum napellus, taking care not to touch it, whilst in the middle of the track was a Lady's-mantle Alchemilla filicaulis subsp. vestita. 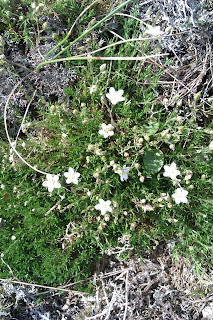 "We were taking a roughly circular route, and on our return leg along a winding lane spotted a farm track to a wider area that looked interesting - it was - sheets of Leadwort Minuartia verna on old mine diggings. "Our final detour was to a spot marked springs on the map, via a footpath. The springs proved worth the detour, with Marsh Valerian Valeriana dioica, Great Burnet Sanguisorba officinalis and Heath Spotted-orchid Dactylorhiza maculata". Julie, who was in a different recording group to Jon, found some nice things, saying "it was the classic carpark scenario - uninspiring at first glance, looks full of ruderal weeds, but in fact had Bee orchid Ophrys apifera and Fern-grass Catapodium marinum, and we (me, Jo and Julian) spent about an hour there. Far more diverse than the horse-grazed fields". Jon's closing comment was: "Now comes the hard part - sorting out all the record cards and typing them into MapMate. Thankfully a few recorders have volunteered to type up their own cards, but I suspect that I will still have 20 or so to do - probably 5000 or so contributions in total to Atlas 2020". Many thanks to Jon for all these reports and to him, Laura, Polly, Kate, John and Julie for providing photographs. If these reports have whetted your appetite and you'd like to come next time plans, the 2018 Summer Meeting will be a joint event with the British Bryological Society and is being held on the Isle of Man from July 16 to 23. Outline details will be in the September issue of BSBI News, and we'll be posting a booking form on the Summer Meeting webpage early next year. So save the date now and watch out for more information nearer the time. I'll leave you with a photo (below) which Laura took of Jon (in typical botanist's pose) and Debbie, both enjoying the wild flowers of Flintshire - nice to see that they got some sunshine in the end!